October 5th 1947, President Harry Truman (1884-1972) makes the first-ever televised presidential address from the White House, asking Americans to cut back on their use of grain in order to help starving Europeans. At the time of Truman's food-conservation speech, Europe was still recovering from World War II and suffering from famine. Truman, the 33rd commander in chief, worried that if the U.S. didn't provide food aid, his administration's Marshall Plan for European economic recovery would fall apart. He asked farmers and distillers to reduce grain use and requested that the public voluntarily forgo meat on Tuesdays, eggs and poultry on Thursdays and save a slice of bread each day. The food program was short-lived, as ultimately the Marshall Plan succeeded in helping to spur economic revitalization and growth in Europe. In 1947, television was still in its infancy and the number of TV sets in U.S. homes only numbered in the thousands (by the early 1950s, millions of Americans owned TVs); most people listened to the radio for news and entertainment. However, although the majority of Americans missed Truman's TV debut, his speech signaled the start of a powerful and complex relationship between the White House and a medium that would have an enormous impact on the American presidency, from how candidates campaigned for the office to how presidents communicated with their constituents. 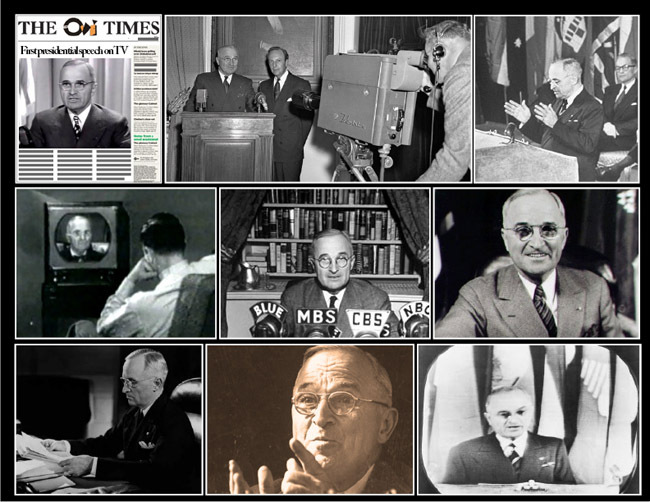 Each of Truman's subsequent White House speeches, including his 1949 inauguration address, was televised. In 1948, Truman was the first presidential candidate to broadcast a paid political ad. Truman pioneered the White House telecast, but it was President Franklin Roosevelt who was the first president to appear on TV--from the World's Fair in New York City on April 30, 1939. FDR's speech had an extremely limited TV audience, though, airing only on receivers at the fairgrounds and at Radio City in Manhattan.